After working so hard on my kids' bedrooms over spring break, and getting hardly any sleep (I've had major insomnia lately), I needed a break. My carpal tunnel flared up (I had forgotten about it until the day after I started removing the texture from the ceiling). I was also extremely sore, like I had lifted weights for first time in years, and my whole body was just aching. So, I told myself that on Tuesday, I would do absolutely no work around the house or any sort of "chores". I ended up reading a book all day, and I actually read the entire book (444 pages) in one day! I have never done that before. I'm a slow reader, and it usually takes me weeks, if not months, to read a book. If it's really intriguing, I can usually get through it in a few days. Anyway, I've been reading quite a bit lately. It all started a few weeks ago, when I got a notification from the library that a book I had requested was available and it was automatically checked out for me (it's an electronic book that the library lent to my account; after two weeks, it's automatically "returned"). I request books every so often, and if it's a popular book, it can take weeks before it's available. If I come across someone's review of a book that sounds good to me, I'll put in the request. I usually forget that I even requested them. Apparently, I had several books requested, because over the next couple of days, I got four more notifications that books had been lent to my account! There is no way that I could read five books in two weeks, but I was going to try to read one of them at least. That one was good, so I read another. On Tuesday, I read an entire book and immediately started a new one. 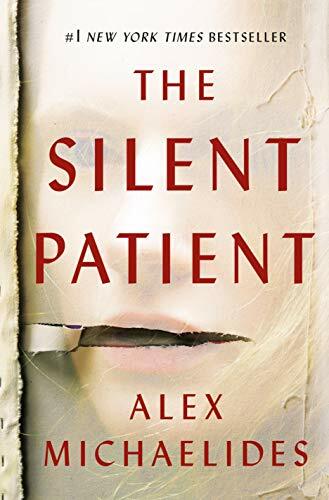 It started with The Silent Patient by Alex Michaelides. It's a psychological thriller, my favorite fiction genre. It's begins with a flashback of a man's murder, whose his wife was charged with the crime. His wife refuses to say a single word (hence, the "silent" patient) and the details leading up to the murder of her husband are unknown because of her refusal to speak. She is sent to stay in a psychiatric care facility, and as of the beginning of the book, she'd been there a couple of years--never saying a single word. Meanwhile, a criminal psychotherapist who was very interested in the murder and her silence accepts a job at the facility so that he can try to work with her and hopefully get her to speak about the details. I won't write more, as not to spoil it, but if you like thrillers with twists and turns, this one was very intriguing--I'm usually pretty good at figure out plot twists, but I could see this going in several directions. That's probably what kept me turning the (electronic) pages! 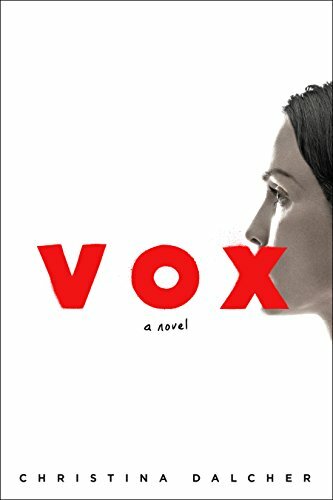 After reading that book, I moved on to a book called Vox by Christina Dalcher. This is a dystopian/sci-fi book that sounded interesting to me (The Hunger Games opened up dystopian novels for me). It reminded me quite a bit of The Handmaid's Tale. It takes place in the United States, where the government is completely ruled by men. Women are basically around to have children, take care of the house, cook, clean--all of the stereotypes. The government decides that women (and young girls) have no real reason to speak, so they are given a limit of 100 words per day (sign language, or any other form of communication, is forbidden). The limit is enforced by wristbands that have a counter, working down from 100, that resets at midnight each day. If a woman goes over that 100-word limit, then she is given an electric shock with the wristband. The main character, who was a doctor prior to the new laws, is asked to help the government with a top secret project. She is an expert on the subject needed for the project, so they want her to accept the position. She bargains for some incentives, knowing she has the upper hand. As she starts her work, she becomes suspicious that something else is going on, and she is determined to find out what it is. This book wasn't as fast-paced as The Silent Patient, but then again, it's not a thriller. Like I said, I like dystopian novels, and this one was good. It made me very aware that 100 words can fly by--just saying goodnight to my kids would put me over the limit! 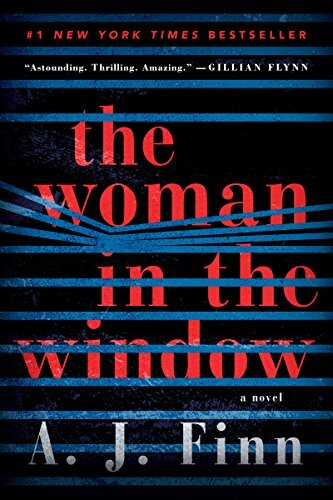 On Tuesday, I started a book called The Woman in the Window by A. J. Finn. This was my favorite of the books I've been reading lately. It's another psychological thriller, and I was especially interested because it focuses on mental illness (depression and agoraphobia). The plot focuses on a woman who lives alone in NYC and she has agoraphobia--a severe fear of leaving her house, or even having the windows open. Ironically, prior to being separated from her husband, she worked as a therapist. She has a daughter who is with her husband, and she speaks to them occasionally throughout the book, but she is lonely without seeing them. After they left, she became agoraphobic and began abusing alcohol and prescription medications. She passes her time by "spying" on the neighbors that live across the street--she has a great view into three or four neighbors' homes. She knows their routines and some family secrets. While spying one day, she witnesses a woman being murdered in the home across the park. Her agoraphobia and substance abuse makes her reliability questionable, and even she begins to wonder what is real and not real. This book kept me reading almost non-stop. The chapters are very short, which made me say, "Just one more!" over and over again, and before I knew it, I finished it. My only disappointment was that I figured out very early on what was probably supposed to be a big shocker toward the end. However, even knowing that information from the beginning, the book was fast-paced and kept me wanting answers until the end. 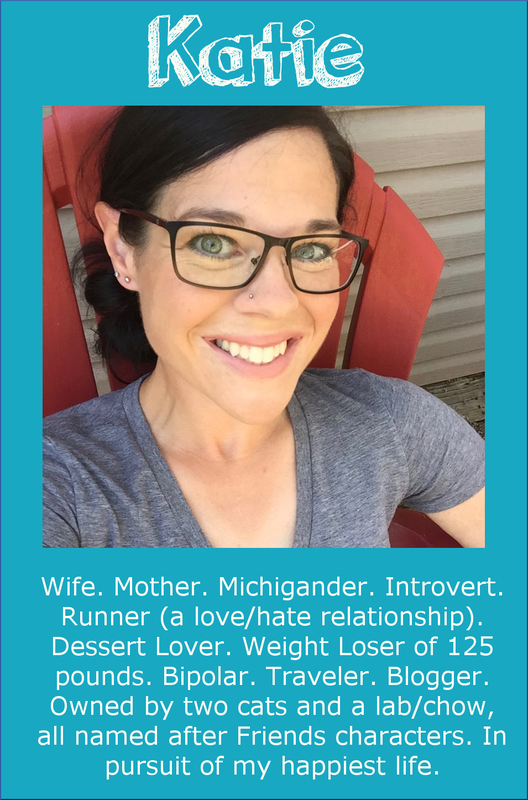 I thought the author did a fantastic job describing her mental illness (I didn't know much about agoraphobia, but I could practically feel her fear from the author's descriptions). And of course I could relate to the depression. 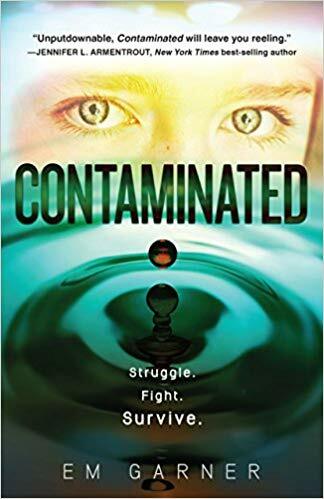 Yesterday, I started a book called Contaminated by Em Garner. It's another dystopian/sci-fi novel. This is about a diet company's product that is contaminated with a virus that causes people to become enraged and act kind of like zombies--attacking people for no reason and killing them. The government finds ways to "neutralize" them with lobotomies and collared devices to control their impulses. They become almost hypnotic and can't care for themselves. Many are abandoned. The main character, a 17-year old girl, finds and cares for her mother who had contracted the disease. I'm only a quarter of the way through this one, but I'm enjoying it! While reading these books, I discovered that I am not a huge fan of Goodreads anymore. I try to use it keep track of what I've read, as well as learning about books that may interest me. Now, though, I find that the reviews people write about books tend to ruin them for me. Not because of spoilers, but because the top reviews seem to be mostly negative (one star out of five) and it can override my own thoughts of the book before I've even started or finished it. I may be enjoying a book, like the ones above, and then when I read the reviews on Goodreads, I see that people didn't like it for this reason or that reason. I find that it sways my opinion a bit, and sometimes makes me not even want to read books that initially sound like something I'd enjoy. So, I downloaded an iOS app called Stacks on my phone to keep track of my books without any of the bells and whistles of Goodreads. It is simply a list of the books I've read, am currently reading, and plan to read--no social integration or reviews at all. 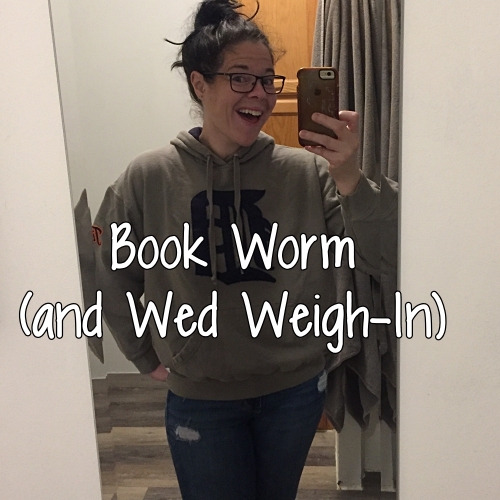 Yesterday was my Wednesday Weigh-In, which I never seem to post on Wednesdays anymore. 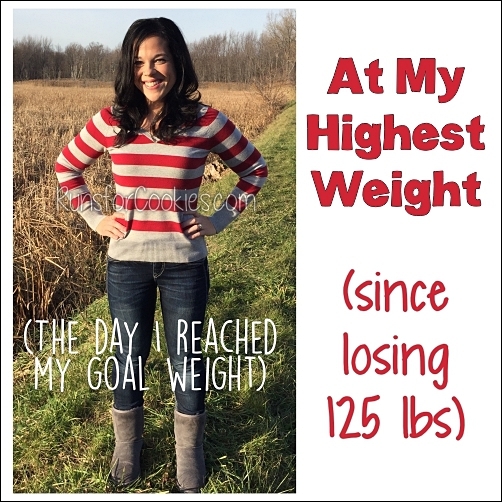 I was very nervous about getting on the scale, and I avoided it all last week. While the kids were on vacation, Jerry and I didn't eat the best--I had cereal for breakfast, skipped lunch as we worked on the house, and then we got Subway several times for dinner. I didn't order healthy subs, either--I got my favorite, the Spicy Italian. Along with chips and a cookie. 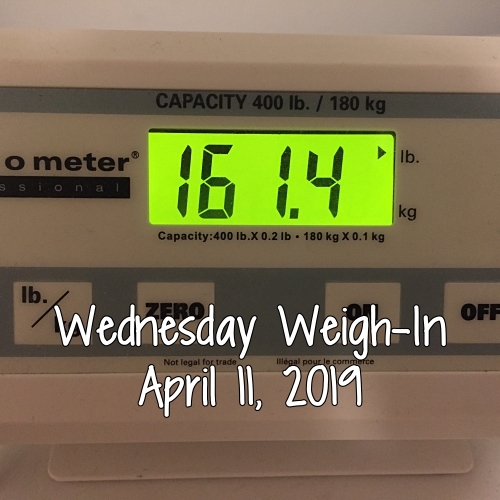 I think my last weigh-in, which was two weeks ago, was 162.4. 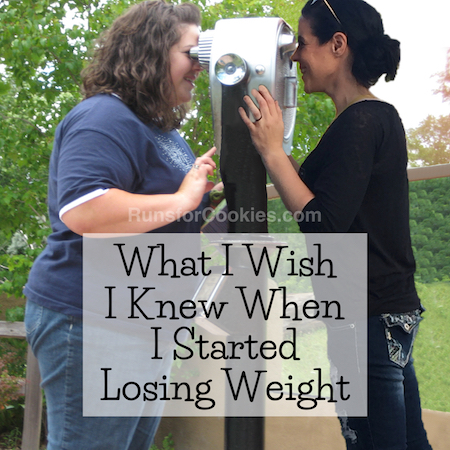 So, rather than gain the weight I thought I had, I actually lost one pound. When the kids got home from vacation, they said that they were really craving healthy, home-cooked food. 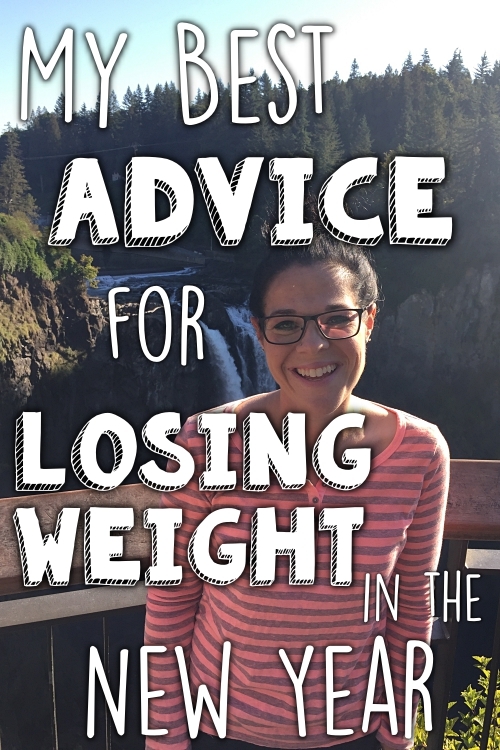 They'd eaten out a lot while on vacation, which they loved, but they were ready for healthier meals. I went grocery shopping with a list of dinners to cook this week, and it feels really good to be eating home-cooked food after a week of Subway! haha. 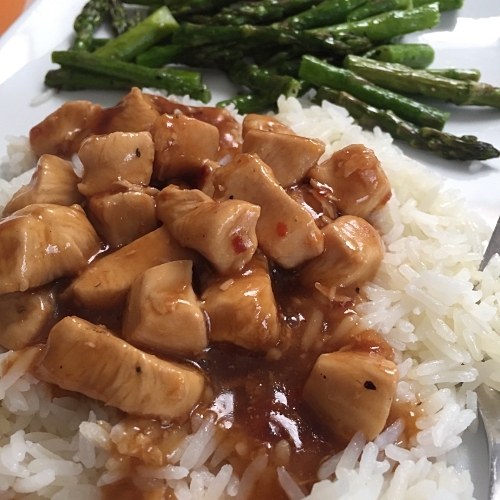 Yesterday, I made General Tso's Chicken and roasted asparagus, and it looked good enough to take a picture (I just posted the recipe as well). It was SO good! The chicken is one of my favorite recipes. 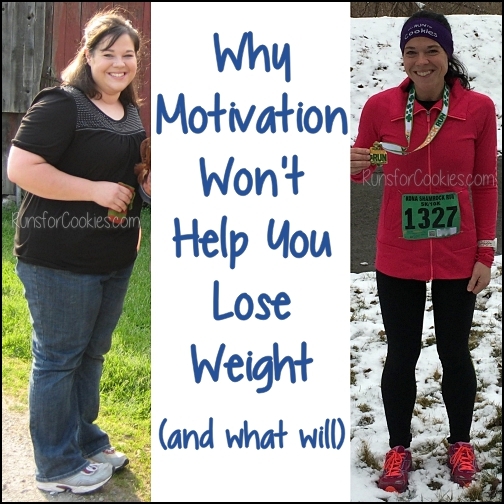 I also need to get back to my walking plan. 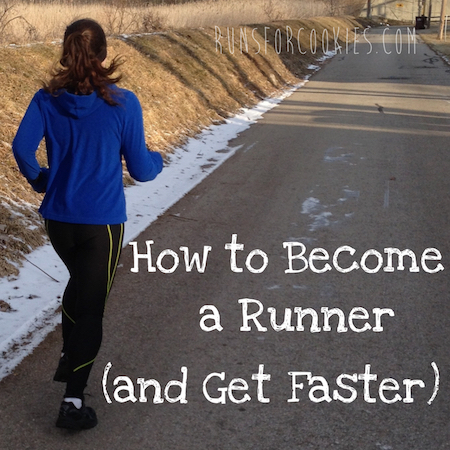 I was so busy last week that I didn't take the time to follow my plan. I know I got a ton of exercise with the housework, but I'd like to get back to deliberate walking for exercise. Just added those books to my list of books I want to read! Congrats on the weigh in, I love pleasant surprises! I have been reading so much more since I got into the e-books offered by my local library! I do the same thing with adding titles to the hold list and frequently get a few at once. Sometimes I have to put it on the hold list again because I had too many books to be able to read in three weeks. I love your suggestions and will look into them! Hey Katie! I think it is so interesting that you enjoy reading books that include characters who suffer from mental illness. I struggle with anxiety and depression and I tend to stay away from those books because I have found that they make my anxiety worse. There has been several times that I have started a book not realizing that there is a mental health element and I have had to quit reading it before I finish it and that is something I never do! Do you ever listen to podcasts? You should try My Favourite Murder while you’re out for walks. They recap true stories, but the girls have great senses of humour and it’s a pretty funny listen. Let me know what you think if you try it!